You might recall a few weeks ago Intel proudly announced a brand new memory standard known as 3D XPoint, the product of a joint collaboration between both Intel and Micron. Intel promised 3D XPoint (pronounced Cross Point) would revolutionize the computing industry, enabling the creation of considerably faster hardware and helping narrow the gap between feeding data from storage (memory) to the processor. 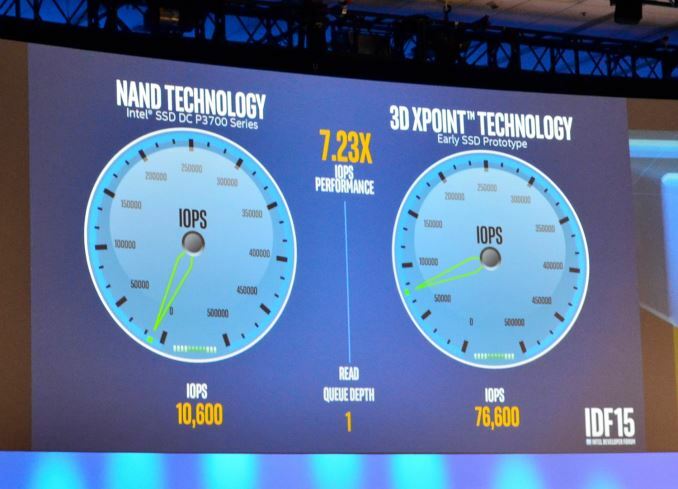 Fast forward to today, and Intel have unveiled their Optane Technology, the official name of products using their 3D XPoint memory technology. The technology is incredibly impressive, delivering around 7.23X greater IOPS performance at low queue depth and upto 5.21 times the IOPS of a conventional SSD. Bare in mind, they weren’t pitting the Optane SSD against a slouch either; instead it was Intel’s own P3700 SSD (one of the fastest SSDs currently on the market as of August 2015). Optane Technology based SSD will also allow much greater densities compared to a more traditional SSD drive,, allowing for far greater storage. How much greater? Intel are promising a mouth-watering 10x, which will mean storage space should skyrocket. Intel’s own marketing material boldly claims it will be 1000x faster than other SSDs on the market – a senses-shattering claim to be sure, but it’s less clear what Intel are being so boastful about – likely not shear bandwidth, but probably latency, which in some applications can be just as important as shear bandwidth throughput. If you’re hoping for us to put out a full technical analysis on how 3D XPoint memory works, you’ll be waiting for awhile as Intel aren’t divulging much of the inner workings of the memory. We do know that it is of course non-volatile memory (meaning it doesn’t lose data when you turn off your PC / unplug it). The memory is created in a cross point array structure, meaning it’s not only extremely stackable to boost density, each memory cell holds a single bit of data. The structure is fairly simple, consisting of both a ‘selector’ and a memory cell which are sandwiched between a wordline and a bitline. This allows you to apply voltage to word and bitline and this will activate a single selector – or a read operation. It’s unknown quite how this process works right now. Currently Intel have stacked up to 32 layers of 3D Xpoint, but have plans to move to a 48 layer design – in fact, it’s already damn close to reaching production. 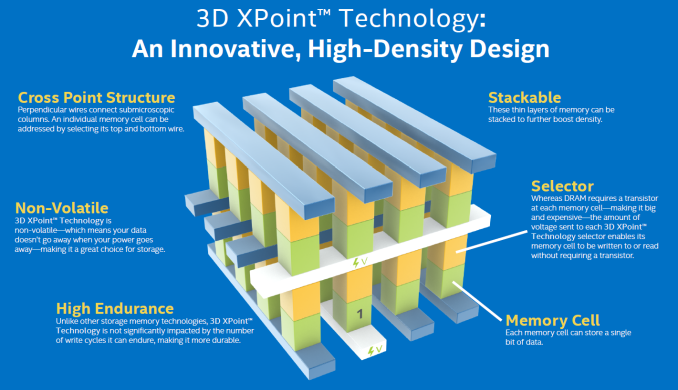 Currently 3D XPoint is on track to be released in 2016, with prototype SSDs being tested throughout this year (2015). The SSDs are planned to be PCIe, and should work across everything from laptops to super powerful server racks – indeed, it’s been confirmed they’ll be available in DIMM form factor for Intel’s Xeon based systems. This article was filed under Articles, Features, Gaming News, Hardware, Mobile, PC Gaming News, Tech News. Tagged with 3d xpoint, hardware, high bandwidth memory, intel, intel memory, PC gaming, SSD.